ABC's "Nightline" touted a PolitiFact story Thursday that rated the five biggest lies of 2010 in politics. The number one lie? Republicans calling the health care bill a "government takeover of health care." When asked why the claim received the status of biggest lie of the year, PolitiFact.com editor Bill Adair answered that it was "so pervasive" and "just not true." "It was so pervasive. It was said by the Republican leadership, by Republicans running for Congress, said by Republicans running for governor. And it's just not true. This is a plan that uses the private health insurance system to expand health care coverage." While the bill does not constitute a single-payer health care system, the 2,200 pages of legislation nonetheless contain countless new rules and regulations enforced by the Department of Health and Human Services, among other federal institutions. Also, the bill includes a mandate for individuals to buy health insurance, under threat of penalty. This is claimed by many to be an unprecedented expansion of the federal government's influence into the decision-making of Americans and their personal lives. The claim was voted on not only by editors of PolitiFact, but also by the public. ABC's Jake Tapper reported that almost 4,000 readers voted. Tapper himself labeled the claim as "a lie repeated far and wide and again and again." Clips played of notable GOP congressmen Rep. John Boehner (R-Ohio) and Rep. Mike Pence (R-Ind.) calling the bill a "government takeover," as well as party chairman Michael Steele and Sen. John McCain (R-Ariz.) saying the same. "Congratulations to the lie of the year for its speed and effectiveness," concluded Jake Tapper. "Way to deceive the public." TERRY MORAN, ABC News "Nightline" co-anchor: Well how can you tell when a politician is lying? When his lips are moving, says the cynic. That's a gross exaggeration and a bad old joke, but if you take the time to look back over a year's worth of prevarication out of Washington, or "mis-speaking" as it's often known here, you might start to wonder. JAKE TAPPER, ABC News White House correspondent: This year's winner was not only selected by the editors of PolitiFact. It was also the people's choice. Almost 4,000 readers voted. 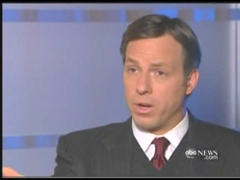 TAPPER: And here to tell us the lie of the year is the editor of PolitiFact, Bill Adair. Bill? And the winner is? BILL ADAIR, editor, PolitiFact: The claim that the Democratic health care bill is a government takeover of health care. TAPPER: A lie repeated far and wide and again and again. MICHAEL STEELE, GOP chairman: This is a government takeover of our health care system. TAPPER: And why is this the biggest lie of the year, as opposed to all those other lies? ADAIR: It was so pervasive. It was said by the Republican leadership, by Republicans running for Congress, said by Republicans running for governor. And it's just not true. This is a plan that uses the private health insurance system to expand health care coverage. TAPPER: Mark Twain once said a lie can travel halfway around the world while the truth is still putting on its shoes. Congratulations to the lie of the year for its speed and effectiveness. Way to deceive the public. MORAN: Well that'll start a debate.